American artist Laurel Burch loved cats and made them her signature. Not just any cats, but sassy, proud, outrageously colorful cats. Bright ceramic mug (XB3682) features her "Feline Family Portrait." Holds 14 oz. Dishwasher and microwave safe. 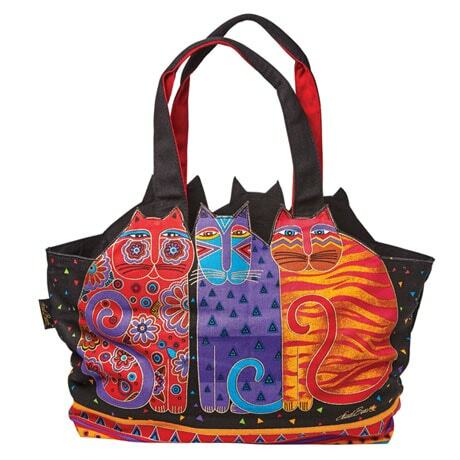 Sturdy, spacious cotton tote (XB3692) stars her "Feline Friends." The shaped top edges make it extra special. 20"w x 15"h x 5"d; 11" handle drop. Imported. Sold separately.